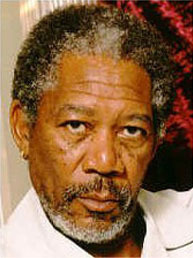 Morgan Freeman is an American movie star, known for playing authority figures. In addition to portraying several detectives in murder mysteries, he played the Director of the CIA in The Sum of All Fears, the President of the United States in Deep Impact, and God in Jim Carrey's Bruce Almighty. He played Nelson Mandela in Long Walk to Freedom, Malcolm X in Death of a Prophet, and baseball-bat-wielding principal Joe Clark in Lean On Me. Even as Jessica Tandy's chauffeur in Driving Miss Daisy or Tim Robbins's prison mentor in Shawshank Redemption, Freeman offered the voice of wisdom. He was born in Tennessee, and raised in Mississippi by his grandparents, after his parents moved to Chicago to find work. Freeman spent most of his childhood summers in Chicago with his parents, where he scrounged for empty bottles and redeemed them for the deposit, so he could buy a ticket to the movies. Freeman worked on stage for decades, doing everything from regional Shakespeare to appearing off-Broadway in The Niggerlovers with Stacy Keach. He made his movie debut with a tiny role in the 1966 drama A Man Called Adam, starring Sammy Davis, Jr. and Louis Armstrong, and directed by Leo Penn (father of Chris, Michael, and Sean Penn). In 1968, Freeman made his Broadway debut in an all-black engagement of Hello Dolly. In the early 1970s, he had a long stint playing Easy Reader and several other roles on The Electric Company, a PBS educational show for kids. Freeman was 50 before landing his first substantial film role, as a pimp menacing Christopher Reeve in Street Smart; Freeman was nominated for an Oscar for the performance. In 1989, he was nominated again, for playing Hoke in Driving Miss Daisy, a role Freeman had played off-Broadway two years earlier. He was nominated a third time for Stephen King's Shawshank Redemption in 1994. In 2000, when 63-year-old Freeman smooched Renée Zellweger in Nurse Betty, it was his first on-screen kiss. Even with his fame and fortune, Freeman still calls Mississippi home. He owns a blues club in Clarksdale, MS, and says he has always found Mississippi less racist than the rest of the country. "I grew up in a segregated society, and that was purposely, obviously, openly segregated and I wasn't given any business about it or anything else. And then I went up to the north and you see it and it's insidious. It's painful and it's insidious, because you want to think something else is going on and it's not. You want to think you're free there. You're not." In 2004, Freeman narrated The Hunting of the President, a documentary chronicling the vast purported conspiracy against Bill Clinton, based on the book by Joe Conason. Before he was famous, Freeman did his share of cocaine, but eventually shook the habit. He did penance playing Michael Keaton's rehab counselor in 1988's Clean and Sober. Freeman, though, still enjoys marijuana, and has no plans to quit. "Never give up the ganja", he says. He has called it "God's own weed", and whenever filming brings him to British Columbia, you'll find Freeman at Vancouver's famous Blunt Brothers marijuana bar.